Buy online Steppe Eastern Carrera 11-3/4 in. x 11-3/4 in. x 10 mm Polished Marble Waterjet Mosaic Tile STPESTCRA and leave review or share with Your friends. The Steppe Eastern Carrera 11-3/4 in. x 11-3/4 in. 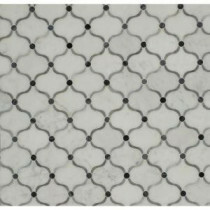 x 10 mm Polished Marble Waterjet Mosaic Floor and Wall Tile is a beautiful blend of White Carrara, Light and Dark Sky Gray marble presented in a truly captivating design, this elegant waterjet mosaic tile is guaranteed to add a timeless richness to your home. Designed from the highest quality material, this magnificent entry from our Steppe Collection is sure to bring you a lifetime of bliss and enjoyment with it's simple, understated Arabesque inspired pattern. Due to the nature of stone, variations in color and veining may occur. This is the natural beauty of the product. 0.96 square foot per piece, each piece sold individually. Piece weight equals 5 lbs.